White-tailes sea Eagles ( Haliateetus albicilla ) were once a familiar sight all over Ireland. The eagle has a long and distinguished history as an Irish bird. Many sketetal remains have been found in ancient sites throughtout the country. These are widespread and range from the Mesolithic (mount Sandel, near Coleraine), some 9,000 years ago, to the medieval (Waterford), 13th-14th century. They have also been found at Lough Gur, County limerick and Woodquay, Dublin. Their presence has been recorded in art and folklore alike from many of the earliest settlements. Eagles have been an important symbolic image in early Christian art. Their form being has been used in illuminated manuscripts, like the the book of Kelles , where it is a common theme, to the eagle holding a fish as illustrated in the Book of Armagh. 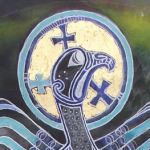 The painting at Mountshannon Harbour, and out logo is based on this eagle. Following the retreat of the glaciers at the end of yhe last Ice Age, about 10,000 years ago, sea eagles became established at sites from Greenland through Eurasia to Japan. 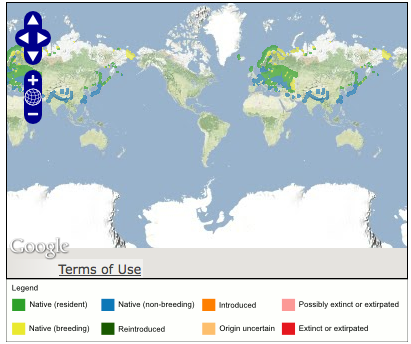 However, persecution, loss of habitat and more recently, pollution have led to a great decline in the numbers of sea eagles across the whole of their range. They have been lost entirly from several countries. Norway remains their stronghold with over 1,500 pairs and eastern Europe also being populated by many. 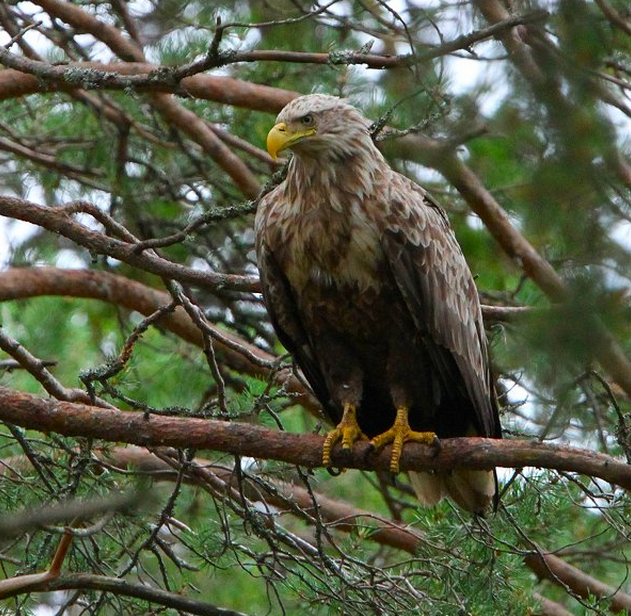 The white-tailed sea eagle is the fourth largest eagle in the world and our largest bird of prey. It has wide, rectangular-shaped wings and a wing span that can be up to two nearly two and a half meters. They are noticeably bulkier and heavier than the sleek golden eagle.They are sometimes called the “flying barn door”. By comparison, the golden eagle’s wingspan rarely exceeds two meters. The birds have characteristic long, broad, fingered wings, heavy bill and short wedge-shaped tail. This species has a large head a large thick beaks and distinctive yellow talons. The adult is mainly grayish-brown except for the slightly paler head and neck, blackish flight feathers, and distinctive white tail. All bare parts are yellow in colour, including both the bill and the legs. It is very similar to its famous close relative, the Bald Eagle, national symbol of the USA. Another striong feature is its yellow eye from which it gains its poetic Scotish Gaekic name, Iolaire-suile-na-grein, ” the eagle with the sunlit eye”. They are born with black eyes and this changes to yellow when they are fully mature around the age of four. Its eye sight is said to be 10 times greater than humans. In juvenile birds, the tail and bill are darker, with the tail becoming white with a dark terminal band as the bird ages. The combination of mousy-brown coloration, broad, evenly-held wings, white tail, strong yellow bill and overall large size render the White-tailed Eagle essentially unmistakable in its native range. It most certainly is in its new habitat on and around Bushy Island. In flight, the adult appears rather like a huge vulture. Its movements are ponderous with wings held flat and the tips often drooping slightly. In general the White-tailed eagle stays close to water, whether it is a lake, a river, marshes and costal areas. The majority of Irish White-tailed eagle, in the past, lived within sight of the sea on coastal cliffs and islets. In favorite localities several pairs might nest on a few kilometers of coast, in contrast to the solitary and highly territorial Golden Eagle. They have also been known to favour small islands in lakes, as is the case with Bushy Island on Lough Derg. These island home are also popular with eagles in Scandinavia and eastern Europe. White-tailed Eagles are sexually mature at four or five years of age. In the case of the Mountshannon Eagles, the male is five and the female is four. They pair for life, though if one dies replacement can occur quickly. We have seen locally that a strong bond is formed when a permanent home range is chosen. They have a characteristic aerial courtship display which culminates in the pair locking talons mid-air and whirling earthwards in series of spectacular cartwheels. Their flight displays end quite abruptly once the eggs are laid. In raptors the female is heavier than the male. The female could weigh up to sea eagle weighs 6 kilos. An eagle weighs about as much as a large cat. It is only when one considers that the eagles wing span can be more than two meters wide and the bird itself is almost one metre tall standing upright, that one realises it is relatively light and fragile for its size. Birds are able to achieve flight because their bones are porous. Sea eagles don’t breed until they are 5 or 6 years old and they live for 20-25 years. Our own breeding pair bred unsuccessfully in 2012 and many felt they were just too young. The nest, or eyrie, is constructed of a collection of large branches and sticks in a tree or on a coastal cliff. The eyrie must offer a clear view of the surroundings and provide easy access for the eagles themselves, but at the same time provide shelter and protection from predators which may steal their eggs and chicks. Its only serious preditore is man. We have observed our eagles being tormented by large gulls and black hooded crows. Last year after the unsucessful hatching, it didnt take the crows long to come to the nest and eat the remains of the chick. White-tailed eagles, being faithful to their territories, once they breed, nests are often reused, sometimes for decades by successive generations of birds. One nest in Iceland has been in use for over 150 years. Fingers crossed we will have a similar experience with our own breeding birds. Last year our eagles made an eyrie on a different tree but on the same Island. So its very hopeful that they will stay on the island for coming years. White-tailed eagles lay between one and two eggs each year. The eggs are laid two to five days apart in early spring and are incubated for 38 days by both parents. It is not uncommon for two chicks to surive amicably in the same nest. This is in contrast to the golden eagle, where the larger chick often deprives the younger sibling of food. The first hatched chick is often largest and is dominant at feeding times. A female chick is often larger than the male and if born second will quickly catch up in size with the first larger chick. This is the Lough Derg Eagles second attemp at breeding. It is not known if they laid one or two eggs the first time round as there was little left in the nest after the crows had been at it. This year they laid two eggs which were sucessful. The first since the re-introduction programme began and also in Ireland in over 110 years. This year there were three sucessful breeding pairs in Kilarney National Park, in County Kerry. Unfortunatly only one of the pairs was sucessful with a single chick. Thic chick was born about two weeks after the Mountshannon Eaglets. Usually the female does most of the brooding and direct feeding, with the male taking over now and then. 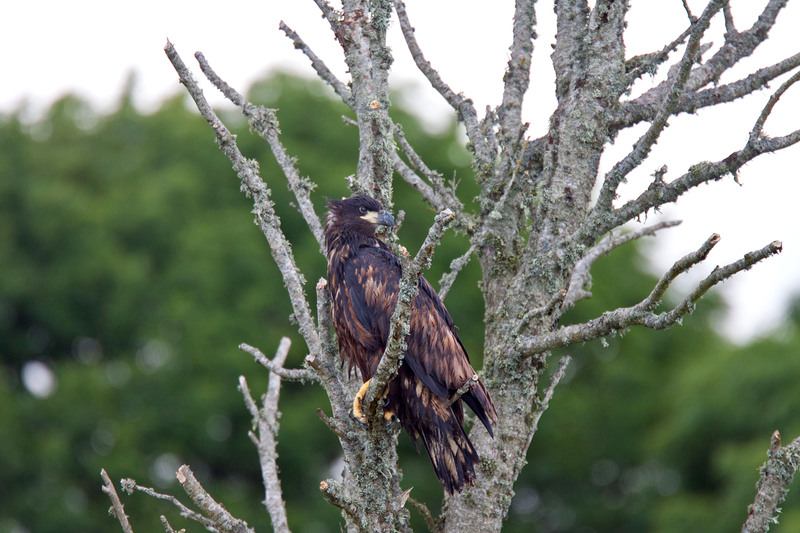 In the case of the Lough Derg eagles, the male eagle did equal share of incubating the eggs. A possible reason for this could be that the male eagle is a year older than the female and is more mature. Young chicks are able to feed themselves from five to six weeks. Although the parents still provide the food and continue to feed them. They fledge at about eleven to twelve weeks, remaining in the vicinity of the nest and dependent on their parents for a further six to ten weeks. At this stage they have reached full development with fully grown adult plumage. It can take some time for them to learn how to catch fish and often in the first year they rely on carrion food. It will be interesting to observe how our eagle chicks get on with fishing. The White-tailed eagle’s skill at catching fish is legendary and the longest of their 8 talons can be up to 4.6 cms long . No wonder the sea eagle has been a bird of myth and legend in Ireland for thousands of years. The species has a rich history in Ireland. Its Irish name of Iolar Mara (sea eagle) reflects its historic association with the long coast of the island. Sadly like so many other creatures and habits of value it disappeared from our countryside over 100 years ago. The last known breeding pair were recorded in 1912 on the coast of Mayo. The first White-tailed Eagle breeding pair since 1912 nested 100 years later on Lough Derg, marking a great success for the Irish reintroduction programme. The sea eagle has a varied, opportunistic and seasonal diet. Depending on habitat and ready availability of prey, the territory of the White-tailed Eagle can range from between 30 and 70 km. Unlike the osprey which soars high above the water searchimg for prey and plunges in an awe-inspiring dive, the sea-eagle tends to glide a few meters above the water befote it stops, hovers for a moment, and decends to snach the unsuspecting fish from the water with barely a splash. Mountshannon Bay is an ideal location to observe the eagles fishing. Virtually any fish found near the surface is potential prey for the White-tailed eagle. On Lough Derg observational and photographic evidence seems to show that Pike are their preferred prey species. But they have also been seen catching breem and trout. The plentyful supply of fish here may explain why they have chosen to nest on Lough Derg. Lough Derg has been home to eagles for milenia as witness by the original place names around the Lough. White-tailed eagles are predators, hunting and eating fresh meat. Fish is one of their main foods, but they also enjoy sea birds, ducks and mammals like rabbits. Many White-tailed eagles, in different habitats to our own, live largely as scavengers, regularly pirating food from otters and other birds including cormorants, gulls, ospreys and various other raptors should they occur in their vast feeding range. Anyone who has seen our local gulls and crows badger and harass our breeding pair can now understand why these birds seem to dislike their much larger new neighbours. Carrion is often the primary food source during lean winter months, with fish and ungulates being preferred. Although sea eagles are well able to catch live prey, they often steal food from other predators or follow fishing vessels in search of discarded scraps. Sea eagles are also scavengers of carrion, particularly in the winter months. Our young family of birds have chosen a habitat that theoretically should offer them endless and varied food source in a lake that is busting with fish and welcomes numerous bird species that Sea Eagles naturally prey on. There is no doubt that hopefully as their population becomes more established , neighbouring counties and habitats around the Lough, with its vast fish resources ,we can look forward to welcoming more breeding pairs. When these beautiful spectacular birds first came to Lough Derg in 2011 we hoped that they would become a part of our beautiful and varied flora and fauna . Little did we know that they would choose our beautiful Lough to fish, to fly, to settle and most excitingly of all to breed. Protection of these beautiful majestic creatures from all possible threats must become our priority so that future generations can experience the joy and excitement of watching our own native population of white tailed Sea Eagles fly in the wild.